are booklets about the historic buildings of the town. The first two in an ongoing series are:. Part 1 includes The Anning House, The Guildhall, The Parish Church, The Town Mill, The (so called) Leper’s Well, The Regent Cinema, The Peek Memorial Chapel, The Grove, Belmont, 6 Cobb Road and The Captain’s House. Part 2 contains Sundial House, Library Cottage, The Philpot Museum, The Victoria Hall, The (new) Three Cups, Aveline House, The Great House, The Retreat, Westhill and The Catholic Church. The books are published by The Lyme Regis Society and can be bought from Serendip, Lyme Regis Museum, Tourist Information, Felicity’s Farm Shop at Morecombelake, Rousden Garage, Archway Bookshop in Axminster and The Book Shop in Bridport. Also included are QR-codes which give fast internet links to relevant web-sites, English Heritage listing information and colour photographs of the buildings. Price: £1.95 each for Historic Houses. 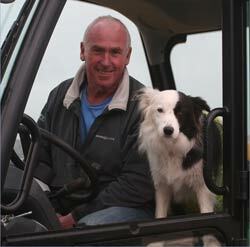 Rosie, the border collie pet of Lyme Regis harbourmaster Grahame Forshaw, is the ‘star’ of a new children's’ book. The book, All In a Day’s Work, has been produced by author Nick Walton and illustrator Mike Riggs and is now available at the RNLI’s harbour-side shop. Nick, 71, a retired teacher, has a yacht in Lyme Regis harbour and got to know Grahame Forshaw and Rosie during visits to the Cobb. The book features Rosie’s adventures including trips on the harbourmaster’s boat and how she helped to rescue a little boy who fell into the water. In real life, Rosie spends many hours in the harbourmaster’s office and around the Cobb where she is a great favourite with visitors as she accompanies Grahame during his duties. TWO long-lamented Axe Valley branch lines, from the golden age of steam, are remembered in a new book for train buffs. Axminster’s one-time railway links with both Seaton and Lyme Regis are prominently featured the new work by historian Colin G Maggs. The Branch Lines of Devon provides a marvellously wide-ranging view of over 160 years of rail travel in the county and begins with a history of the famous Bluebell line between Axminster and Lyme Regis. The author tells how work on the track began in 1900 but the engineers soon encountered some tricky problems along the way. The Branch Lines of Devon is an absorbing and well researched book packed with black and white photographs celebrating the golden age of the railways, as well as featuring the continuing success story of the Seaton Electric Tramway which continues to carry thousands of passengers along the tracks. It is available in paperback, priced £16.99. Colin Maggs is a highly respected authority on railways, having written more than 80 books about them. He has also appeared on radio and TV and in 1993 he received the MBE for services to railway history. The 400-year-old links between the Bermuda and the British coastal town of Lyme Regis – birthplace of the “Sea Venture’s” Admiral Sir George Somers– are celebrated in a new children’s book by Bermudian artist/writer Betsy Mulderig. The Bermudian children’s author honour Bermuda’s connections with Lyme Regis in her latest release “Toppy Tours the Dinosaurs”, set in the West Dorset town. Ms Mulderigg — author of the long-running Bermudian children’s book series about the adventures of Tiny The Tree Frog — introduces a new character in her latest book. In In the new volume, tourist dinosaur Toppy visits Lyme Regis’ Jurassic Coast, where he discovers how he gained all of his personality traits from his ancestors. “Toppy Tours the Dinosaurs” is now on sale in Lyme Regis. It is the first book in a series that will see Toppy touring dinosaur touring children around Palma, Paris, Venice and London in the near future. Toppy will show a child various sights in different cities and teach them, as well, to speak a few words of thoset cities’ languages. Sherlock Holmes and the Lyme Regis Horror By David Ruffle The year is 1898. Doctor Watson is once more in Lyme Regis to visit the lady in his life, Mrs Beatrice Heidler. A gruesome death with echoes of one of Sherlock Holmes previous cases brings Holmes himself down to Dorset. In the company of an old friend, they encounter an old enemy with vengeance on his mind. A tale of revenge, violent deaths and plum puddings. Described as a “drama-documentary”, this book recounts one of the most disturbing war-time incidents in Lyme Regis. Prior to the D-Day landings hundreds of American GIs were stationed in the town and on the night that Jimmy Cagney entertained the troops in the Marine Theatre there was a riot in The Square between the white and black troops. The book combines fact with fiction in telling a series of stories about the impact of the GIs on Lyme and its people. The riot did happen but was quickly hushed up by the authorities. £5.99 from Serendip Books, Broad Street. an illustrated children’s book by local author Janis Lane Meet the Ecosaurs is a story, which introduces local Jurassic Coast dinosaurs and other creatures. Written by Lyme resident Janis Lane and illustrated by Somerset-based Jennifer Crabb, the book uses historically accurate information as a backdrop for a fantastic storyline, which will thrill, fascinate and educate children in equal measure. His Life and His Paintings” Minnie Churchill, formerly married to Sir Winston’s grandson and director of Churchill Heritage, co-authored this book with David Coombs. The book, which carries a foreword by Mary Soames, tells the story of his life through his own pictures. Published with the full co-operation of Sir Winston’s family, this is the only definitive book on Churchill’s paintings. A year in the life of Lyme Regis: A new book by local journalist PHILIP EVANS LYME REGIS town has a colourful history, a fiercely independent nature and close community spirit. The year 2007 was not a momentous one for Lyme Regis - few years are - but Lyme Matters provides a unique insight into a year in the life of a small, seaside town, as seen through the columns of local newspaper editor PHILIP EVANS. It chronicles the achievements of the people of Lyme Regis and its many differing interests, the petty politicking so prevalent in all small communities and the sheer joy in living in such a beautiful part of the world. Lyme Regis Pocket size: 50 pence published by the Lyme Regis Society. available from the Tourist Office, Museum, Post Office, Serendip Books and the Town Mill shop. "Roaming Lyme's Landscape" Describes all of the footpaths in a roughly five mile radius of Lyme. Full directions are given along with notes. A coloured map of the footpaths, along with their County identification number, is included. published by the Lyme Regis Society priced at £3.50 available from the Tourist Office, Museum, Post Office, Serendip Books and the Town Mill shop.